Although I've made strudel many times, I've never made it quite like this. It's the strudel of our grandmother's era, made by hand, completely from scratch. 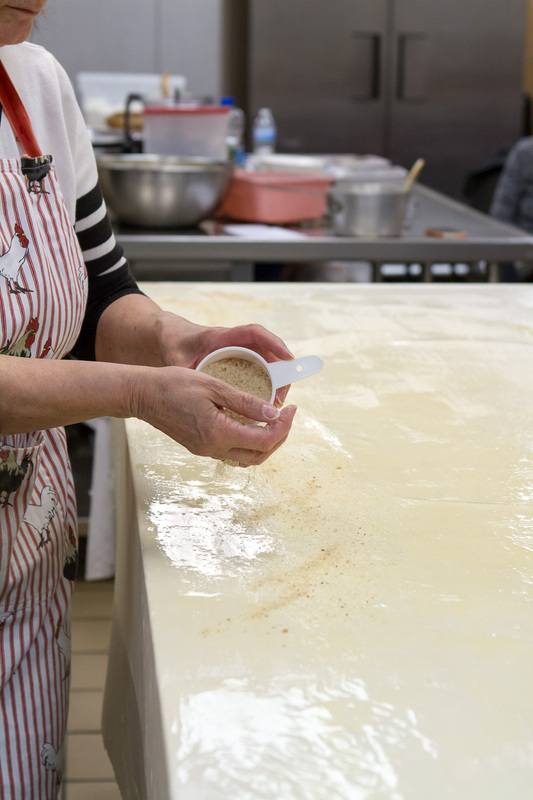 In the windowless kitchen of a Slovenian church in Cleveland's Collinwood neighborhood, Micka and her sister keep this old world tradition alive through the classes they teach. We watched, listened, and even participated in the process of stretching the dough over a cloth lined table until it was so long, it resembled a tablecloth. Great fun and pure magic! Would I try this at home? I would if I could recruit a couple of friends to help me (you know who you are!). The dough looked surprisingly easy to make. Unlike pie dough which calls for a light hand, and icy cold ingredients, strudel dough was much less tempermental. No chilling was required. The dough was mixed in a food processor, then lightly kneaded by hand, and set out to rest before it was stretched and pulled. Once the dough has rested for about an hour, Micka rolls into a rectangle. It's given another short rest before the process of pulling and stretching begins. It's astonishing how long and wide the dough can be pulled without tearing. Isn't it amazing? It looks just like a tablecloth. If you want to see it live, check out the video below. Once the dough has been stretched and pulled, Micka trims the ragged edges. A student brushes the surface of the dough with melted butter. Micka then sprinkles fine dry breadcrumbs along the lower edge of the dough. Next comes thinly sliced apples that have been tossed with lemon juice and grated peel. A sprinkling of sugar follows. The sugar is added just before rolling the strudel to prevent the apples from releasing their juice. With the help of the students, the tablecloth is lifted to aid in the rolling of the strudel into a long log. The log is cut into 4 equal pieces and placed on a greased baking sheet. Melted butter is brushed over the logs before baking. In the bowl of a food processor fitted with the blade, combine all ingredients to make a soft dough. Process until it forms a ball. Remove from bowl, dust lightly with flour and knead until smooth and no longer sticky. Transfer to a lightly oiled bowl, turn the dough once so that the top is oiled, and cover with plastic wrap. Let it rest for 1 hour in a warm place. Peel, core, and slice apples. Toss with lemon juice, zest, and cinnamon if using. Don't add sugar yet as it will draw out the juices from the apples. Set aside while you prepare the dough. Line a 4 x 6 table with a cotton tablecloth. Place dough on the cloth and with a rolling pin, roll into a rectangle about 1/2 inch thick. Brush with melted butter and allow to rest 10 minutes. Dust your hands with flour. Starting on one side of the table, slip the back of your hands under the center of the doughand move them apart, stretching as you go. There are several videos available on youtube demonstrating this technique. Work your way around the dough until it cover the top of the table. If the dough resists stretching, allow it to rest before continuing. Using the pads of your fingers, stretch the dough so you have about 8 inches of overhang. Using a knife or scissors, trim the ragged edges. Preheat oven to 350F. Grease a large baking sheet with butter. Brush the dough with melted butter. Sprinkle the breadcrumbs along the long edge of the dough. Scatter the apples evenly over the breadcrumbs. Sprinkle with the 1-1/3 cups of sugar and cinnamon, if using. Slowly lift the tablecloth evenly on the long side where the filling is. It's helpful to have one or two people helping. Roll the dough over the filling continuously until you have a long log. Cut into 4 even logs and place on a greased baking sheet. Brush the tops with melted butter and bake at 350F for 1 hour. Allow to cool at least 30 mnutes before serving. Note: This recipe makes a large quantity of strudel. It can be cut in half, or wrapped and frozen before baking. It can then be baked directly from the freezer when you are ready.